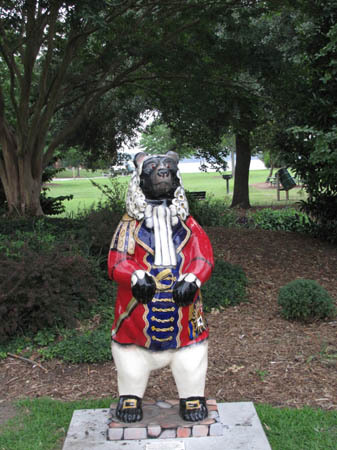 June 2 - Deb and I arrived in New Bern on Monday afternoon. We had a good trip over from Beaufort anchoring out on Sunday night finally getting away from the traffic of Memorial Day. Everyone is a boater on the holiday. Unfortunately, we weren't able to sail because the winds of cruisers, on your nose, were once again back. 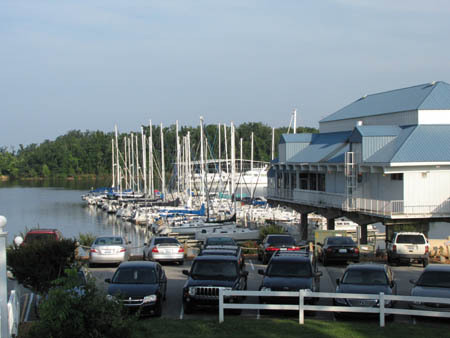 We had chosen New Bern Grand Marina because of recommendations from our friends on Scandia. It has proven to be a wonderful choice. 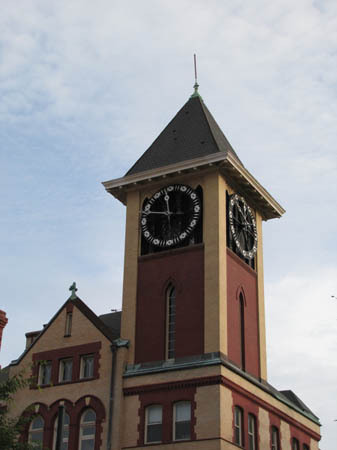 The price is $8.50 per foot if you stay a month and it drops to $7.50 if you stay 2 months or $6.50 if you stay 3 months. That is a good deal but we won't be staying longer than our one month because we really want to do this trip up to New York and beyond. 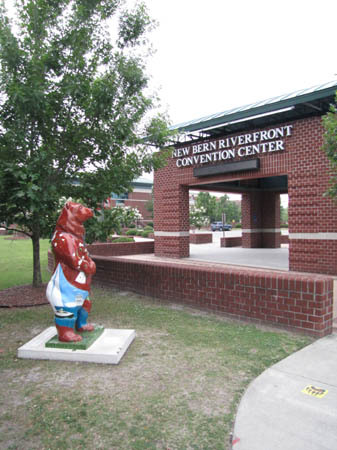 I'm not sure what it is about bears but New Bern loves them. Evidently it is part of a historical thing but I don't have the complete story yet. I'll get that when we get back from our road trip. I've taken a walk each morning looking around the town but really won't have a great overview again, until we return. We are getting the boat ready to leave it here on it's own for a couple of weeks. That used to be a normal thing but now it seems very strange. 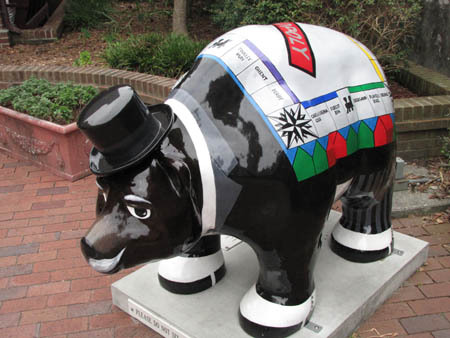 Chicago had it's cows and New Bern has it's bears. 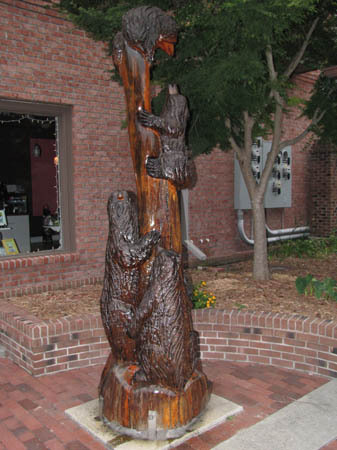 Even carved bears. 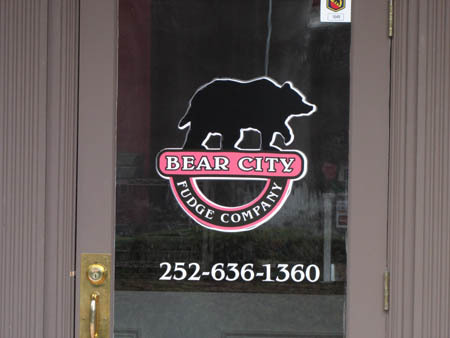 There are several shops that have names associated with bears. 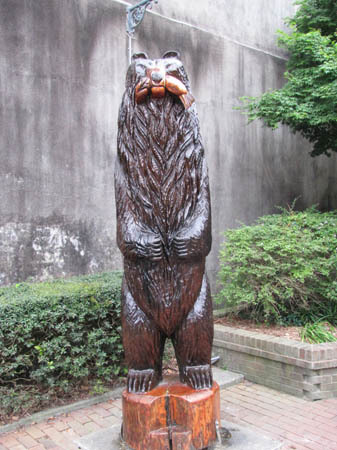 Even the police cars have a reference to bears and of course the school teams are named "bears." Research is obviously required. Here I am on a walk and found a very important part of history. 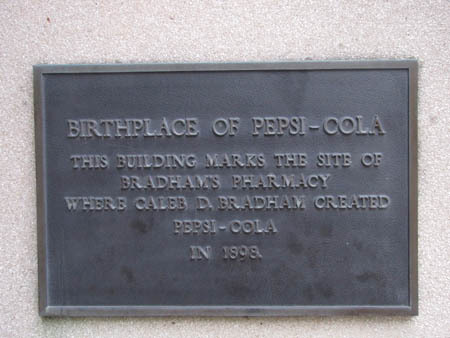 Pepsi Cola was invented here as you can see from the signs below. 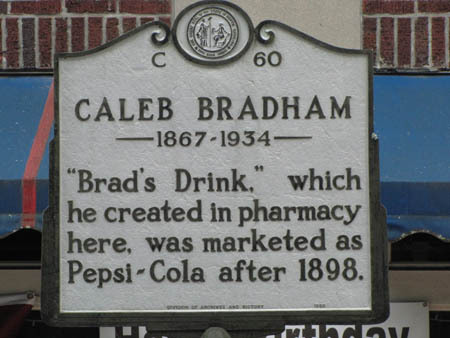 Evidently, Brad, made it up and got bought out. We will have to go into the current shop and buy a Pepsi when we get done cleaning up the boat. 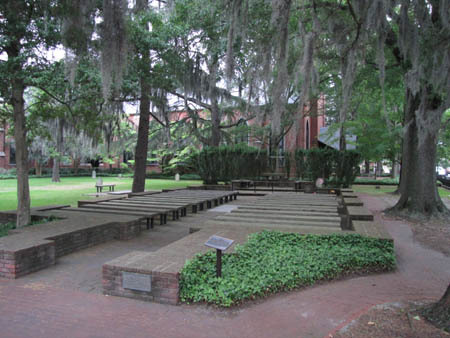 The oldest church in town has a wonderful outside seating area and it wouldn't surprise me if this goes back to it's origin. I really don't know but a tour of the church will be on our list again, when we return. I thought it was a really cool setting with the spanish moss hanging from the trees. 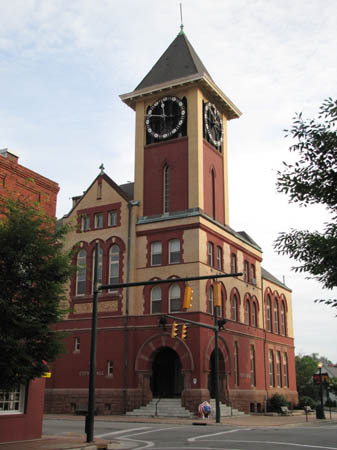 The town clock only says the right time twice a day currently and perhaps they will be fixing it as a part of their 300th year celebration. That would have been a cool project if you ask me. 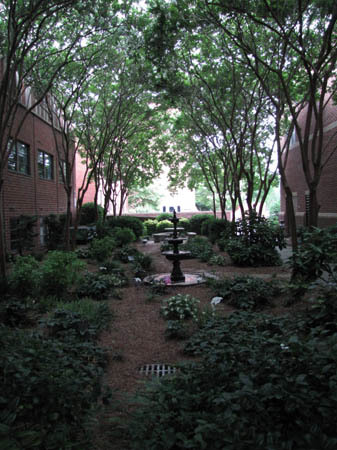 I've just scratched the surface of exploring New Bern but found this somewhat hidden garden at another church. I loved the way the trees were providing the canopy for the garden. It really provided a difference between light and dark in the garden. We will be picking up a car this afternoon and taking Jimmy Buffett off on his vacation. We found a bird breeder who will be taking care of him while we are off on our 3,000 mile plus road trip. If you are only following us for the cruising, then tune back in three and a half weeks from now and we will be getting ready to leave and go north. Otherwise we will be updating as we go. I'm really looking forward to a bunch of this trip because we will see some really good friends and family as we drive around. 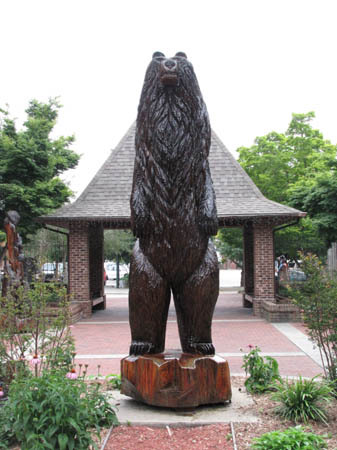 I also hope to get a few pictures in the smoky mountains which I haven't driven through in 30 years. 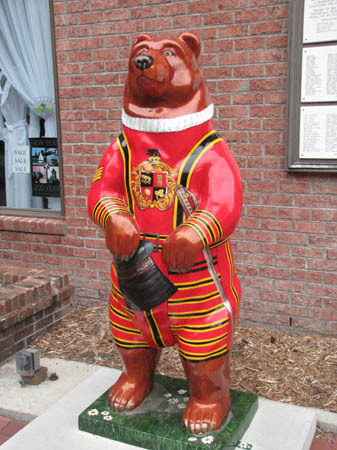 June 6 - We had a wonderful drive through the smoky mountains but never once did I see a place to stop. In Missouri, they have scenic overlooks but not on this road. Everytime a great view came up there were signs everywhere saying "No Stopping." Signs, Signs, everywhere's a sign. Do this don't do that can't you read the signs. Well, we did this time and didn't stop. Sorry. We aren't going through Green Turtle Bay on the way back so we will be taking a different road. Perhaps we will get some pictures then. I know you've seen Green Turtle Bay before but above are a couple of pictures showing it is back and in beautiful condition after the spring flood that devastated Nashville. We had an absolutely wonderful afternoon and visit at Green Turtle Bay in Grand Rivers, Kentucky. I saw lots of people we had gotten to know last year along with a number of friends we've known for many years. 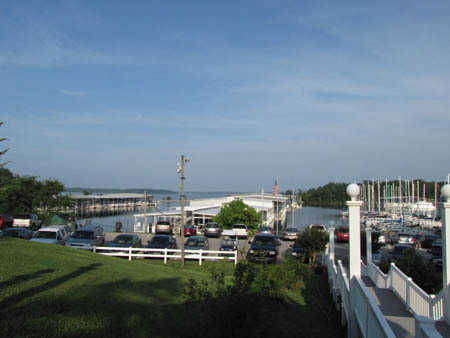 Up at the yacht club we ran into even more people and then had dinner with our great friends Bill and Bette. The time was just too short but we know we will see them in Florida this next winter. I was able to have breakfast with a few more friends before Deb and I headed on up to St. Louis. Deb and I made it to St. Louis at about one and caught up a bit with my cousin Julie. We will be hanging out here in St. Louis doing a number of things but mostly it seems we will be making our annual visits with our doctors to make sure we will live another year. Early summer in St. Louis is always lush and beautiful. Although it didn't seem like too much had changed with the exception of the completion of highway 40 which I'm sure everyone is happy about. June 11 - No pictures but his one you just have to read. We had a good trip to St. Louis and caught up with a number of people but not near enough. Sometimes I think I should impose on more people just to catch up but then I remember the boat may be sinking so we are always in a hurry to get back to get moving again. I thought we had dropped out and time was no longer a factor. Someday. The only good thing to write about that might be of interest is to connect a few conversations we had with our trip to Nebraska. It seems every time we have a conversation on "dry land," to take a phrase from Waterworld, everyone wants to know if we feel safe out in the ocean. I explain over and over how we can go in the weather we want and stay put for storms or if the wind is way up and the seas will be really bad. Still they don't think we are too bright out in the big blue ocean. Fast forward to yesterday and our trip driving up to Omaha. After making our turn off of interstate 70 to 435 I saw this push lawn mower in the left lane of the south bound interstate and people were swerving. I picked up my cell phone to call the highway patrol and the last thing I saw in my rear view mirror was a car swerving towards 18 wheeler and then I lost sight. Can you just see an accident happening because a lawnmower fell out of the back of a pickup truck? After we reported that, we figured the excitement was over. Then about 20 miles outside of Omaha a person in the right lane decided they wanted to pass without looking at the fact that we were directly beside them in the left lane. I swerved just in time for them to miss us by inches and took to the shoulder. They never knew this was happening and simply went on and passed with me braking hard and sticking it out on the shoulder until they were past. Now you might think the excitement was over but wait, there's more. We got through Omaha and heading for our friends house driving up 132nd street. I saw this kid come out from a fence on the grass hill chasing a dog. They were heading for the street and traffic. I kept expecting an adult to show up in chase. Looking in the rear view mirror, no adult and then the dog ran across the 4 lanes with the kid right behind and traffic slamming on their brakes. I immediately found a place to turn around and we headed back. Nobody else had stopped. The kid was running down a hill behind a retirement center and I let Deb out to chase him down. I parked and ran towards the place they were all last seen with my cell phone in hand to call 911 once we caught the kid and figured out where we were. The dog with kid in chase was almost out running Deb heading back towards the street. I could see myself tackling the kid and having people call me in for a child abduction but who cared. The kid had escaped death once and things needed to be controlled. As it turned out the dog crossed the road and Deb caught the kid before I had to do the tackle. Then we steered the kid back towards the entry to the retirement home when a lady came out looking at us like we were child abductors. We told her the story and she was obviously a mother and knew how to take care of the kid who we guessed was about 2 years old. We left him with her and assurances that they would find his home. I dropped Deb off at our friends and went back just in case the police were involved and they really needed more info. When I got back, about 15 min after all this happened, the lady had found the kids aunt who was baby sitting. All came out ok.
Now I'm back to thinking about the people on "dry land" who want to know how safe it is out where we live. Duh, give me the water any day. This "dry land" stuff is scary! I'm talking really scary. We will be in Omaha for about a week having fun with our friends and working on a couple of projects. Actually, the projects will be fun too. We will be finishing up an airboat that Steve is building. Now that will be fun. Hopefully, the other excitement is over until our trip back.